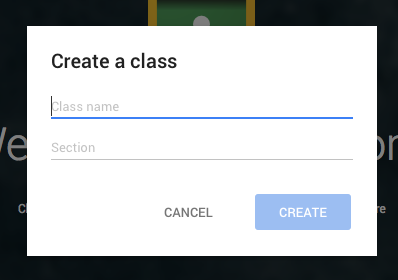 To create your first class go to classroom.google.com and sign in as a teacher. Then, you will click the "+" sign in the upper right hand corner and click "Create Class." When you click create you will be taken to the homepage for your new classroom! 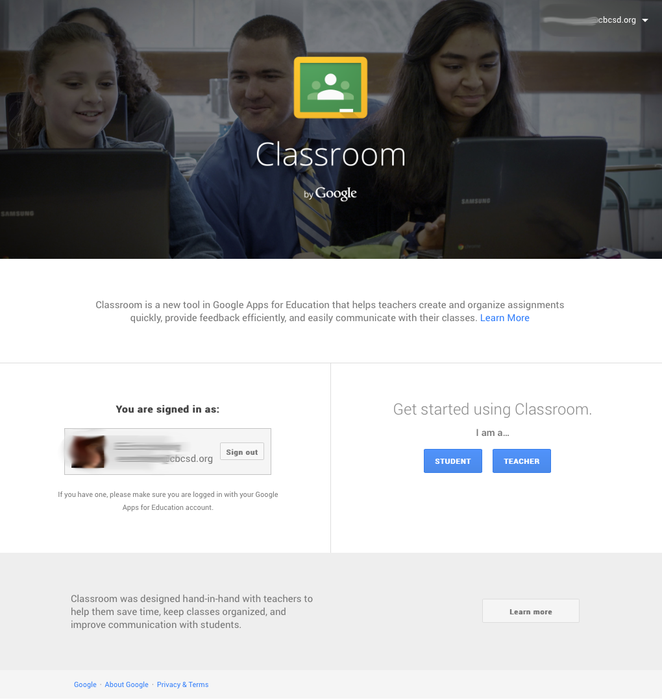 This is the page you will see if you have not logged in to Google Classroom yet. Sign in as a teacher. Click the "+" sign in the upper right hand corner and then click "Create Class." Give your class a name, and also provide a section. 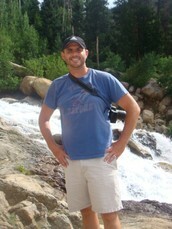 The section could be the year (elem folks) or the trimester and period (secondary folks). 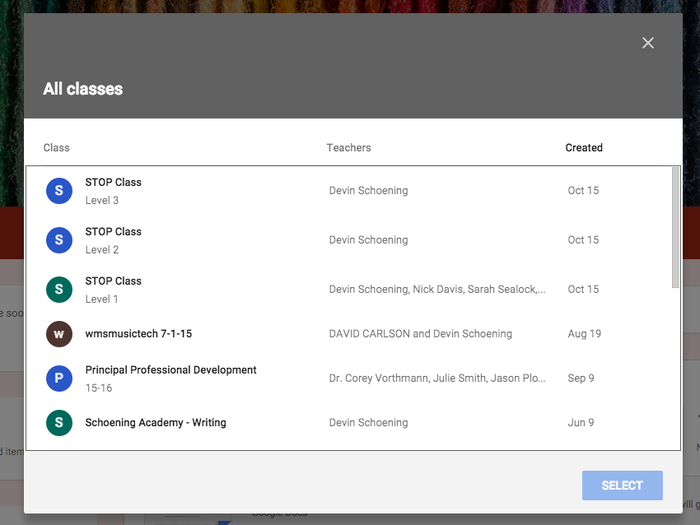 This is what the screen will look like after you give your class a title, a section, and click create. There are two methods for adding students to your Classroom, but the easiest way is to have them use the unique class code that is created for each Classroom that is created. 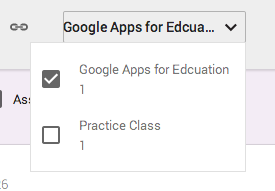 All you have to do is have students access Google Classroom (either through Apps, or classroom.google.com), sign in as a student, and click on the same "+" you did. But, instead of creating a Classroom they will click "Join Class." 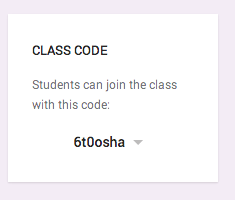 Once the students click join class, they will be prompted to enter the unique class code you provide to them. They will automatically be enrolled in your class. 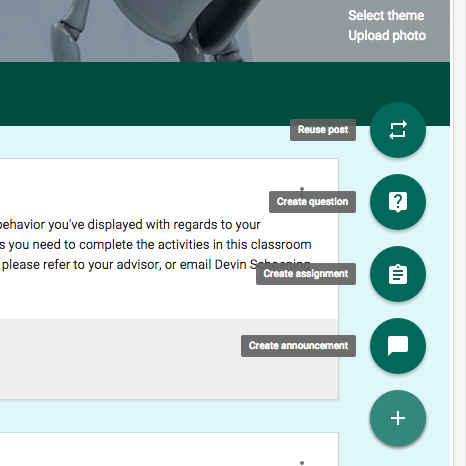 The class code will show up on the left hand side of the class home page. 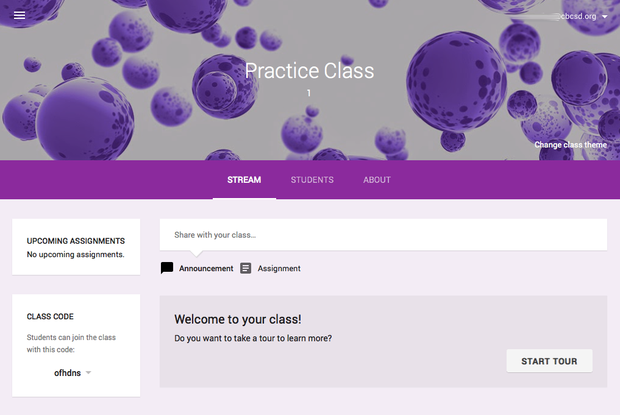 Students see the same screen that teachers do upon their initial visit to Google Classroom. Just make sure they enter as a student. 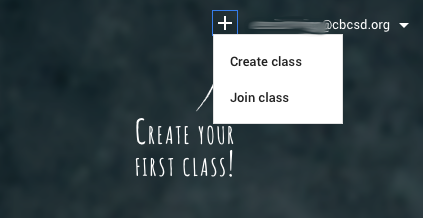 The students will click the same "+" sign in the upper right hand corner, but they will only have the option to "Join Class". 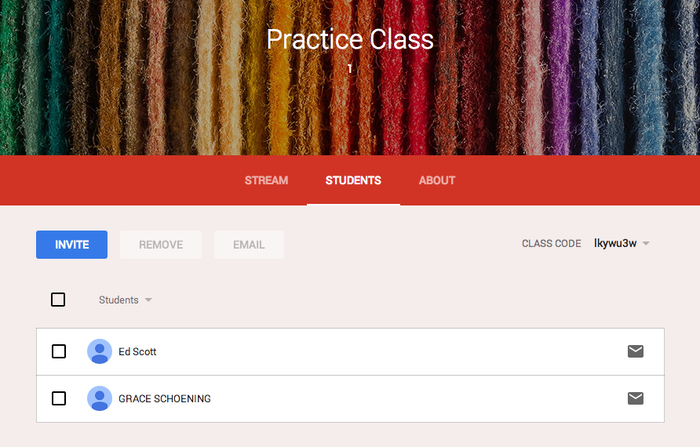 A unique class code is created for each class created in Google Classroom. Teachers will provide that code to students, and they will enter the code to join the class. This will automatically enroll students in the class. "The Stream" is the element running right down the middle of the page. There are two pieces that you can add to the stream...Announcements and Assignments. In the stream, new items are placed at the top and everything else is pushed down. 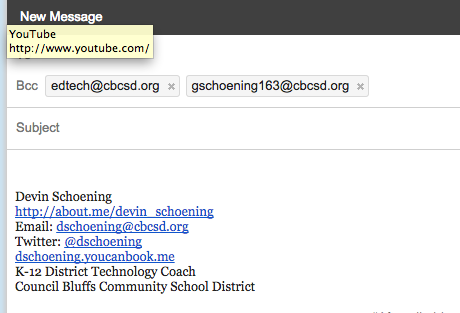 Announcements allow you to include any combination of text, links, Google Drive items or YouTube videos. You can also push an announcement to one, multiple or all classrooms you have created. The Stream is where all of the class content resides. 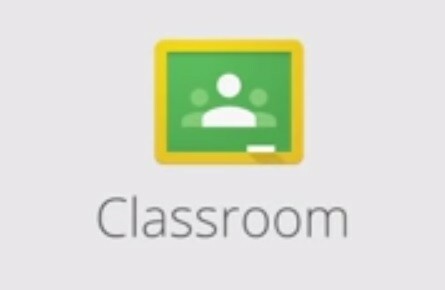 The "+" sign in the bottom right hand corner of the Google Classroom home page is where you click to add information to the stream. Announcements are one option. If you have multiple classrooms, you can push the announcement to any/all of the classrooms at once. Once you post to multiple classrooms, IF you have to edit the announcement, you have to edit in all classrooms. Edits will not push out to all announcements. This is what a finished announcement would look like in the stream. 1 - You will be asked to create an assignment title and have the option of adding an assignment description as well. 2 - You can set a due date/time. 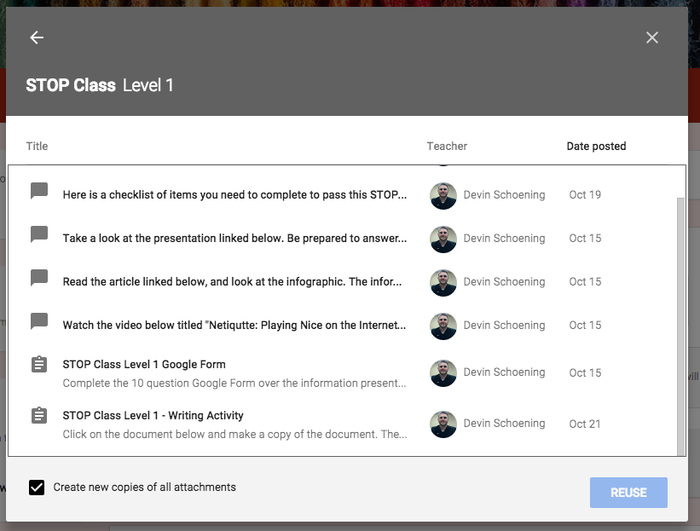 3 - And most importantly, when you include a document from Google Drive, you will have the option of setting the document as "Students can view file" (all students viewing the same file), "Students can edit file" (all students editing the same document) or "Make a copy for each student" (a copy for each and every student, including their name). Included with attaching items to an assignment, you will also include an Assignment Title, Assignment Description and Due Date/Time. 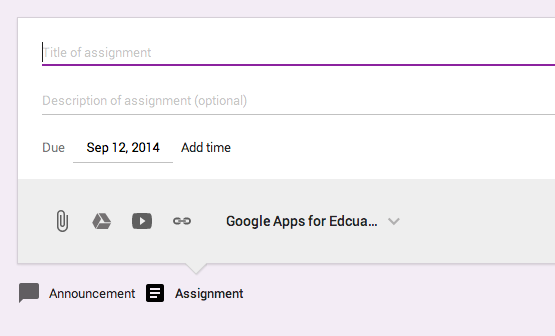 If you have multiple classrooms, you can push the assignment to any/all of the classrooms at once. Once you post to multiple classrooms, IF you have to edit the assignment, you have to edit in all classrooms. Edits will not push out to all assignments. This is what the assignment looks like in the stream. 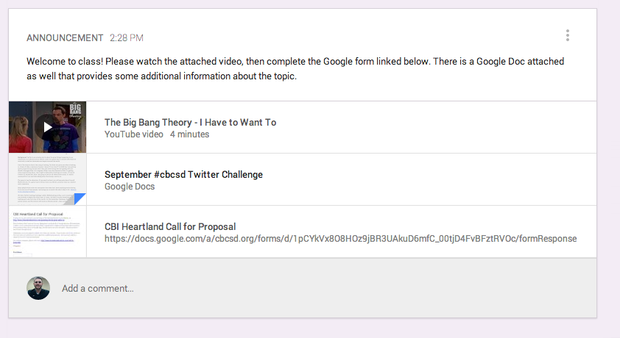 A new feature to Google Classroom is that you can add questions to the stream to stimulate classroom discussion. The interface to add a question looks very similar to the interface for adding announcements and assignments. This is the new button in Google Classroom to add content. You can ask a question, set a due date, and see who has (and has not...) answered. Like announcements and assignments, you can add files from your computer, items from Google Drive, YouTube videos and links to your questions. 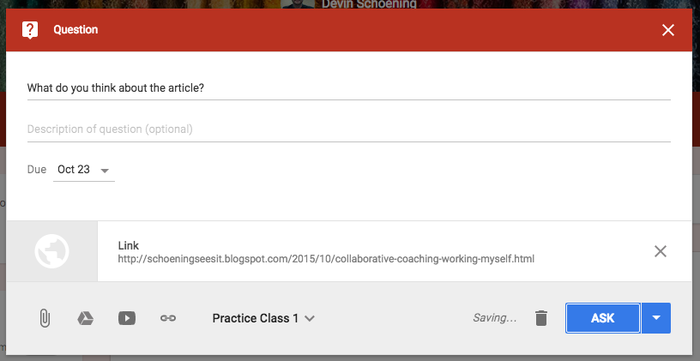 One great new feature to Google Classroom is the ability to reuse a post that was previously used in another Google Classroom. The "+" button is used to add content top the stream. Choose the Classroom where the post was originally used. Once you select the classroom, all the posts will show up. Choose the one you would like to reuse. One of the nice things about Google Classroom is that you will have the ability to quickly and easily email any/all of your students with just a click or two. 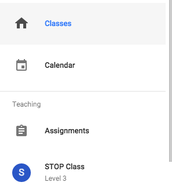 You will no longer need to create a class contact list in your Gmail as Google Classroom will create it for you. In the middle of the screen, next to "Stream" you will see a tab labeled "Students". This is where you will access the class list. Once you click students, you will see a screen showing each student in your class. Each name will have a profile picture and a check box to the left. You will also see an email icon on the right hand side. The three tabs once you are in 'Students' are "Invite", "Remove" and "Email." 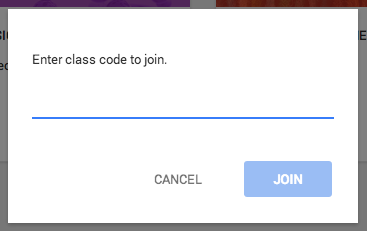 To email the entire class, click the check box below where it says invite. This will select all. Then simply click the "Email" button. You will then be taken to a new window to compose the email. One of the nice things is that the email you send to the class creates a blind carbon copy to all recipients, meaning those receiving the email will not know who else it was delivered to. 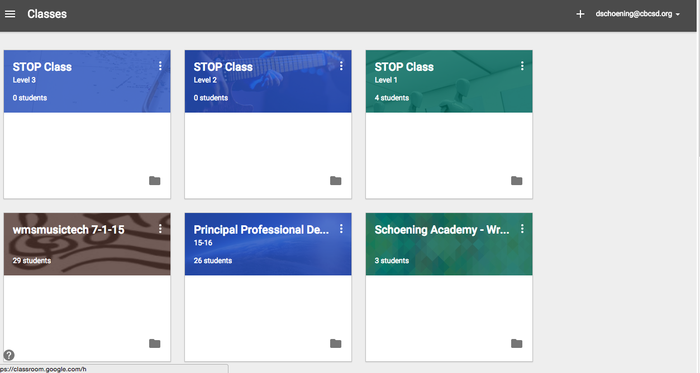 Another new feature to Google Classroom is the fully integrated Google Calendar functionality. 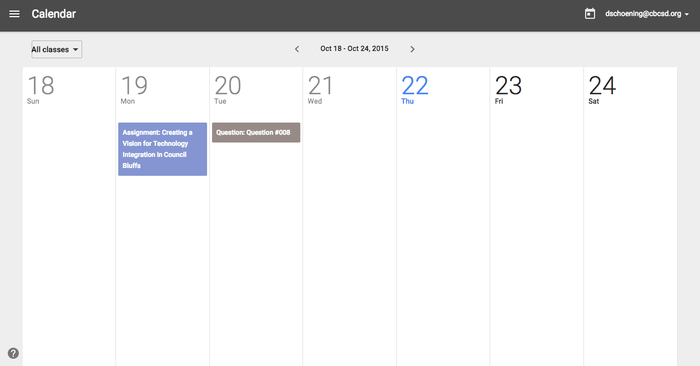 You can now see all upcoming assignments on a Google Calendar view. When you are in the view to see all of your classrooms, click the three lines in the upper left hand corner. Click on "Calendar" which is right below "Classes". You will see a week's view of the upcoming assignments. You can choose to see all classrooms, or select a classroom.